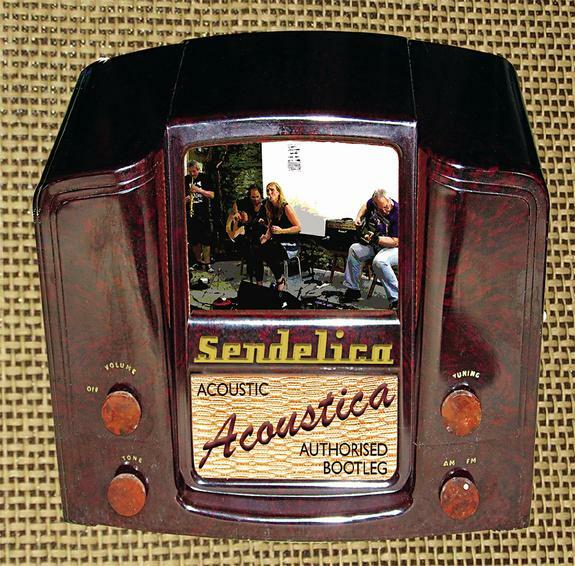 Now here’s something different… Sendelica unplugged! This one off acoustic performance featuring Pete, Glenda and Lee plus Alice on vocals was recorded on Sunday August 9th at the 13th Dream of Dr. Sardonicus Festival. Released on 10″ vinyl (SOLD OUT) and CD by the Fruits de Mer Records offshoot Friends of the Fish label, the EP is also available for download. Hear another side of the band as they play their well known to fans Spaceman Bubblegum in lazy droning strummed acoustic guitar and saxophone style which gives the music a kind of drugged Folk-Jazz and, later, lulling melodic feel. This is the one instrumental and Alice sings on the rest. Clubtimes Over has an acoustic Folk-Pop feel that alternates nicely between powerful and delicate, and the song has a lively instrumental finale. Then we’ve got two covers. Ziggy Stardust is exactly what you might imagine an acoustic guitar and sax duet cover might sound like. And Venus In Furs works well as an acoustic song and the melodic sax really takes the tune in directions that Velvet fans wouldn’t expect. Definitely one for seasoned Sendelica fans who should check this out for another view of the band.